Thirty local community projects across London have been awarded funding to help make cycling ‘more accessible for everyone’. Latest figures show that just 25% of people from non-white or mixed backgrounds cycled at least once in 2017/18, compared to 37% of people from white backgrounds. In addition, only 15% of people from non-white or mixed backgrounds commuted by bike at least once in 2017/18, compared to 40% of people from white backgrounds. 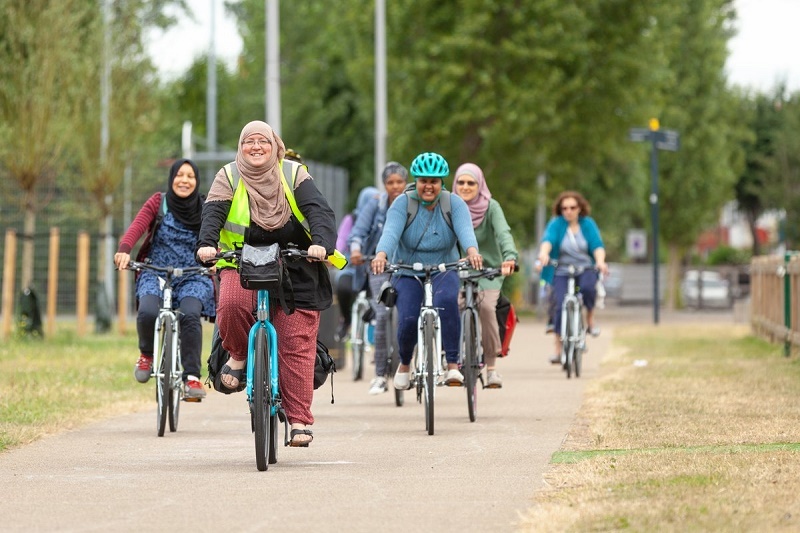 The funding forms part of TfL’s Cycling Grants London initiative, which aims to help groups that are traditionally under-represented in terms of active travel. The winning projects stretch across London and range from schemes that train young people in bike maintenance to a project that encourages women working in hospitals to cycle. Other beneficiaries include a project to train young offenders to become bike mechanics, cycling groups for disabled and homeless people and a cycle training and maintenance project for the Hindu Bengali community. TfL says it is committed to increasing the number of women and diverse groups that cycle, including those from Black, Asian and Minority Ethnic (BAME) backgrounds and people with disabilities. 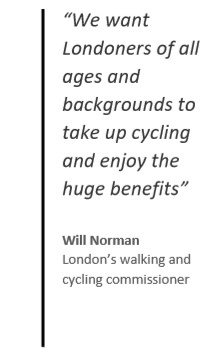 Will Norman, London’s walking and cycling commissioner, said: “We want Londoners of all ages and backgrounds to take up cycling and enjoy the huge benefits. “These grants directly support local groups to run brilliant projects in their communities encouraging many more people on to two wheels. Elsewhere, TfL is moving forward with plans to start construction later this year of a new 7km cycle route in west London. Apologies for the spelling error Aubrey. You’re referring to the promotion of health and well-being for the population generally which I couldn’t imagine anyone having a problem with, including me, as you will have noticed from the first line of my last para “Promoting higher levels of activity – in this case cycling across the board is fine…”. My issue is the Tfl’s pointless statistic of how many people from different social groups are not apparently participating in cycling as if there is some reason for this which must be addressed and be equalised …perhaps there isn’t a reason and that’s just the way it is. If there’s an upsurge in cycling generally, do we really need to know what social groups they’re from? Finally yes, I do have a problem with some statistics in road safety i.e. their source, the way they’re analysed and subsequently analysed. Aubery: I was highlighting the fallacy and sometimes illogical analysis of statistics in the belief that they are significant and therefore need addressing. Promoting higher levels of activity – in this case cycling across the board is fine, but why the need to divide it into groups of people from different backgrounds – where’s the connection? Perhaps those who don’t cycle, walk a lot, or go to the gym, or play five-a-side football at weekends or badminton etc. etc. It doesn’t say anywhere that people from differing groups in society have to participate in an activity to exactly the same level, which if I’ve read it right is Tfl’s goal. If it’s a ‘fact’ that say, fewer women than men cycle well ..that’s all it is – a fact, but not necessarily a problem which the authorities have to fix. The Tfl seem to have been strangely compelled to highlight those percentages of cyclists of certain ethnicities who don’t cycle, as if it’s somehow significant and of concern. Perhaps those who don’t cycle – regardless of their background – simply don’t want to, for reasons which, quite frankly one could say, are nobody else’s business, as it’s their choice. Perhaps the Tfl would be surprised to learn also, that amongst all the other types of road users in the UK, there is also a mix of backgrounds.